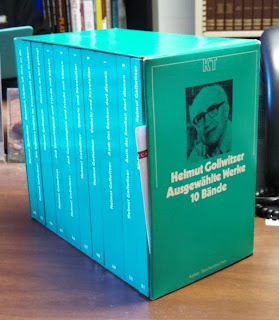 Collin Cornell recently provided a guest post here at DET entitled, “Helmut Gollwitzer and John Webster on Scripture, or, the problem of *ethical* biblical criticism.” It is a very thoughtful post, and it has generated a number of comments. Twenty-seven, to be exact. That conversation is very interesting and I encourage you to go read it thus far. But it was recently the scene of an extensive set of comments by David Congdon in response to Phil Sumpter and addressing a number of interesting questions that depart somewhat from the subject of Helmut Gollwitzer and John Webster on the doctrine of scripture (although they grow organically from the starting point). Breaking News—DET KBBC Book is now in print! W. Travis McMaken and David W. Congdon (eds. ), Karl Barth in Conversation (Eugene, OR: Pickwick Publications, 2014). Head on over the W&S website to order a copy and take advantage of a special price for online orders ($29.60 rather than the retail $37)! You can take a peek at the front matter and table of contents here. Many thanks to the contributors, but also to the many readers of DET and the KBBCs over the years that made this project happen. Interacting with folks on theological topics is what makes theology blogs fun, and this book is a monument to lots of the fun that has been had here at DET over the years. Thanks to our other entries for participating, and to all the readers who came by and voted. I wish I had enough copies to give one to each of the finalists. But here are the links to the three finalist entries once again. This was fun! Maybe I’ll end up with an extra copy of something again and we can do round two. Book Giveaway Poll - Get Voting! There you have it, folks! You've seen all the entries over the past few days, and now it is time to pick a winner! Karl Barth should remain an important theological voice in 21st century theology for multiple reasons. Generally because he was one of if not the most influential theological voice of the 20th century, and theologians should always build on the good work of those who came before. What I will focus on, however, is how Barth relates and differs with both liberal and fundamentalist Protestants - two groups that together dominate American Christianity, making Barth as relevant as ever. DET Book Giveaway Contest This Week! That’s right! It’s time to give that book away! For those of you who may have forgotten, DET is giving away a copy of the new Westminster Handbook to Karl Barth (WJK, 2013) edited by Richard Burnett. The call went out, submissions came in (fewer than I would have liked, but enough), and now it is time for you – gentle readers – to choose a winner! We have three contenders. Starting tomorrow (Tuesday), I will post one entry a day through Thursday. The posts will go up in alphabetical order by author. On Friday I will post a poll and folks will have a chance to vote through the weekend. The author who gets the most votes gets the book! I’ll post one week from today to officially ratify the results. In the interests of full disclosure, I have (very lightly) edited the submissions for typos, etc. I’m excited! But then, free books always get me going. Apparently it works even if I’m not the one getting them… Come back tomorrow for the first entry! John Webster’s Holy Scripture: A Dogmatic Sketch (Cambridge, 2003) is a carefully argued fugue on one theme: reintegrating the doctrine of Scripture into a properly theological account of God’s saving work. Webster moves Scripture from its station as theological doorman and gives it place with the other main dogmatic foci. Like them, its adequacy depends on God’s act in Christ and not on standards drawn from elsewhere. Jason Goroncy broke the news about this a little while back, but I thought that I would acknowledge it here as well. I was very happy to review his book, which you can view for purchase here. To find out what I thought about it, read the review (for those without permissions, Jason posted the .pdf so surf over there). As a bit of a spoiler, my review is positive. W. Travis McMaken, review of Jason Goroncy, Hallowed Be Thy Name: The Sanctification of All in the Soteriology of P. T. Forsyth (Bloomsbury T & T Clark, 2013), Reviews in Religion and Theology 21.1 (2014), 45–47. I think it’s been a little longer than a fortnight… Anyway, here is the usual link to the last set of links that I posted for you. Some exciting things have happened since then. For instance, the DET book giveaway contest saw its submission deadline pass! I’m currently working my way through the submissions and getting them ready for posting. My plan is to post them here at DET over the course of a week, and then to open a poll so you, gentle readers, will be able to vote and pick the winner! So, watch for that soon. This is an excerpt from a sermon that Gollwitzer preached in Berlin in either 1939 or 1940, when he filled in after Niemöller’s internment and before his own conscription. During this time Gollwitzer preached through Luke’s narrative of the passion. In this excerpt you will perhaps hear, as I do, echoes of our own ecclesial situation today. Helmut Gollwitzer, The Dying and Living Lord, 92–93. Bold is mine. Mark R. Lindsay, one of the scheduled speakers at the upcoming Princeton Barth Conference , reviews Michael T. Dempsey, Trinity and Election in Contemporary Theology (Grand Rapids: Eerdmans, 2011). Lindsay calls the volume “an attractively presented book which engages with one of the most intriguing and hard-fought battles within Barthian theology of recent times,” so surf on over and see what it’s all about.